Not to be confused with Lake Oswego, Oregon. Oswego Lake is a lake in Clackamas County, Oregon that is completely surrounded by the city of Lake Oswego. Though the lake is naturally occurring (a former channel of the Tualatin River), it has been significantly altered because of the concrete dam that has increased its size to 395 acres (1.60 km2). 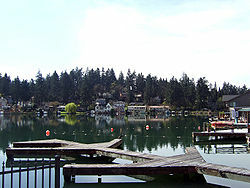 The United States Geological Survey records the official name as Lake Oswego and, because of its artificially increased size, classifies it as a reservoir. To distinguish it from the city, however, the lake is usually called Oswego Lake. The lake is a former channel of the Tualatin River, carved in basalt to the Willamette River. Eventually, the river changed course and abandoned the Oswego route. About 13,000 to 15,000 years ago, the ice dam that contained Glacial Lake Missoula ruptured, resulting in the Missoula Floods, which backed the Columbia River up the Willamette River. The flooding created an underwater vortex called a kolk, which scoured out and enlarged the old Oswego channel, creating a natural lake. The rocks and boulders were flung by the kolk up to a mile away to present-day Durham and Tualatin, where they were quarried for many years before the site was converted to the Bridgeport Village shopping center. The lake was known to the native Clackamas people as Waluga ("wild swan"), for the birds they hunted there. With the arrival of European settlers in the mid-19th century, the lake was called Sucker Lake for a type of fish that was abundant in its waters. In 1847, Albert Alonzo Durham built a sawmill on Sucker Creek, the lake's outlet to the Willamette River. In 1850, he made the first Donation Land Claim in the area, which he named Oswego after Oswego, New York. In 1865, the Oregon Iron Company was incorporated with the goal of making the town of Oswego an industrial center for the smelting of the abundant iron ore in the area. The company purchased the entire town of Oswego, including the lake and surrounding hills, which were rich in not only iron ore, but trees that would be turned into charcoal to feed the furnaces. Population in the town boomed, aided by the opening of a narrow gauge railroad from Portland in 1886. The Oregon iron industry peaked in 1890, but with the availability of cheaper coke-fired iron and steel mills, by the early 20th century it had nearly collapsed. The Lake Oswego Canal was built in 1872 to connect then-Sucker Lake to the Tualatin River. In 1871, the Tualatin River Navigation & Manufacturing Company began work to build a continuous waterway that would connect the Tualatin River to the Willamette. The company planned to build two canals: one to connect the Tualatin to the lake to provide access to the iron smelter, and a second with locks that would connect the lake to the Willamette via Sucker Creek. The first canal was finished in 1872, but due to low water, was not passed through until January 21, 1873, when the sternwheeler Onward made the first trip. In 1873, the completion of the Willamette Falls Locks made traffic past Willamette Falls possible without portage; since the Tualatin was more difficult to navigate anyway, the idea of a second canal was abandoned. A series of wooden dams had been built at the outlet to Sucker Creek beginning in 1860 to provide water power; but since winter floods would wash out these dams within a few years, in 1921 a concrete dam was built, which not only provided a more reliable power source, but also allowed the lake level to be precisely controlled. The level was allowed to rise several feet to cover the unsightly stumps left over from logging and create a more visually appealing shoreline. With the name Sucker Lake considered unappealing to potential residents, the community decided to rename the lake. While "Lake Tualatin" was considered, in 1913 the United States Board on Geographic Names officially renamed it Oswego Lake. In 1961, the USGS officially changed the name to "Lake Oswego," though the old name is usually used to avoid confusion with the name of the city. In 1928, a marshy area known as the Duck Pond adjacent to the lake was flooded, and a canal dug to it to connect to the main lake to create Lakewood Bay, which allowed more shoreline homes to be built next to the newly completed Pacific Highway (now part of Oregon Route 43). With the demise of the iron industry, the now-renamed Oregon Iron & Steel Company turned to development of its approximately 23,000 acres (93 km2) of land surrounding the lake. The company built a power plant in 1909, just before the incorporation of the City of Oswego in 1910. Headed by Oregon Iron & Steel president William M. Ladd (son of former Portland mayor William S. Ladd, who was one of the original investors in the Oregon Iron Company), the Ladd Estate Company converted the iron town into a prestigious lakeside retreat. In 1924, Paul Murphy developed the Oswego Lake Country Club to promote Oswego as a place to "live where you play." The Paul Murphy Company replaced Ladd's company as developer of Oregon Iron and Steel's property in 1940, and the following year, Oregon Iron and Steel created the Lake Oswego Corporation, which still owns the lake as a private corporation of lakefront property owners. In 1960, shortly before ending its existence, Oregon Iron & Steel was disbanding deeded the powerhouse and dams to the corporation. With the relative scarcity of building easements, lakefront property remains prestigious, and a number of architecturally significant homes have been built along its shores, including the Carl C. Jantzen Estate, a Tudor-style estate on the National Register of Historic Places, built on an island on the lake's north shore by the founder of the Jantzen swimwear company in 1930. In addition, the lakeshore features homes by noted Portland architects such as Richard Sundeleaf and Van Evera Bailey. 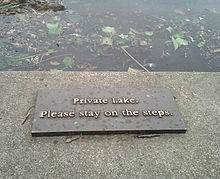 Despite a decades-old status quo in which the Lake Oswego Corporation maintains that it owns the lake and has the authority to restrict access to it, state and local law enforcement have recently indicated that they consider the lake to be public and that they will not pursue charges against anyone for using it. As of 2012, local law enforcement was on the record saying the water is public property and that it was more likely to charge the corporation's security patrols with unlawful arrest than to cite swimmers or boaters for enjoying the water. To control the waters, the corporation has posted "no trespassing" signs and issued permits to select individuals who overcome various administrative hurdles. The corporation also regulates boat and operator licensing, water safety, and water quality, but those regulations may not be actually binding. With most land around the lake privately owned, and following a unanimous vote by the Lake Oswego City Council to bar entry to the lake from several lakefront parks, few people have been able to test the authority of the corporation to enforce those regulations. The ability of the corporation to restrict access to the water has been questioned on numerous occasions. According to recent independent assessments of the legal situation, including a 2005 Oregon Attorney General opinion regarding the public's right to use navigable waterways in Oregon, the waters are publicly owned, though the ground beneath the lake is owned by the shareholders of the corporation, including 690 lakefront property owners and another 515 families who belong to one of 20 waterfront easement associations. The corporation argues that the federal Water Resources Development Act of 1976 specifically classified the lake as non-navigable; therefore, the Attorney General opinion—which states that waterways over private land are only public if they are "navigable-for-public-use"—does not apply. The corporation also asserts that the lake is an artificially-expanded power reservoir and not a natural body of water. 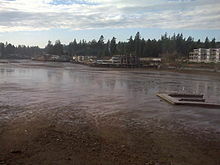 In May 2012, a federal lawsuit was filed against the city of Lake Oswego to prevent it from limiting public access to the lake. The case was dismissed from federal court in October, with the judge indicating that the state of Oregon, due to its presumed ownership interest, should be able to weigh in on the case. The plaintiffs refiled in state court in November 2012, and in 2014, the judge ruled that the city had the right to block access. The Oregon Court of Appeals upheld the lower court ruling in 2017. The plaintiffs appealed to the Oregon Supreme Court, which agreed to hear the case in April 2018 to determine whether the lake is public and if the city can prohibit access. Lakewood Bay during 2010–2011 drawdown. Periodically, the corporation lowers the water level in the lake by opening the dam to enable lakefront property owners to conduct repairs on docks and boathouses. In September 2010, the lake was drawn down approximately 24 feet (7.3 m) to allow replacement of an aging sewer pipe that traverses the lake, the lowest lake level since 1962 when the original sewer line was installed. The lake was refilled to its usual level in the summer of 2011. In recent years, the lake has experienced explosive algae growth in the lake, due in part to runoff from lawn fertilizer, which is rich in phosphorus. ^ a b c d e f g h Johnson, Daniel M. (June 1985). Atlas of Oregon Lakes (PDF). Oregon State University Press. p. 114. ISBN 0-87071-343-4. ^ a b c "Lake Oswego". Atlas of Oregon Lakes. Portland State University. Retrieved April 2, 2012. ^ a b "Feature Detail Report for: Lake Oswego". United States Geological Survey. Retrieved February 6, 2012. ^ a b Schouten, Hank (May 29, 1984). ""Lake Oswego" lochs up first place in name game". The Oregonian. p. 1MS. ^ Stephens, Patia (Winter 2001). "Sedimental Journey". The Montanan. University of Montana. Retrieved 2008-04-02. 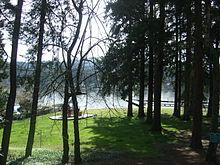 ^ "Oswego (Sucker) Lake, Lake Oswego, Oregon Waymark". Waymarking.com. Retrieved 2008-04-02. ^ a b c "A Brief History". City of Lake Oswego. Archived from the original on 2008-04-01. Retrieved 2008-04-02. ^ a b Kuo, Susanna Campbell. "A Brief History of the Oregon Iron Industry" (PDF). Oswego Heritage Council. Archived from the original (PDF) on 2008-11-19. Retrieved 2008-04-02. ^ a b Corning, Howard McKinley (2004). Willamette Landings (3rd ed.). Portland, Oregon: Oregon Historical Society. p. 195. ISBN 0-87595-042-6. ^ a b c "Eight Myths Concerning Lake Oswego". Oswego Heritage Council. Archived from the original on 2008-08-02. Retrieved 2008-04-02. ^ Goetze, Janet (February 2, 2008). "Big new homes lack grace of the past, says architect". The Oregonian. Retrieved 2008-04-02. ^ a b c d e f Cizmar, Martin (2012-03-07). "Lake Affront". Willamette Week. Portland, Oregon. Retrieved 2012-03-09. ^ "Other Links: Oswego Lake". City of Lake Oswego. Retrieved 2008-04-02. ^ Bailey Jr., Everton (April 3, 2012). "Lake Oswego approves new park rules banning lake entry from city-owned property". The Oregonian. Retrieved May 14, 2012. ^ a b Amick, Steven (October 1, 1982). "One voice raised against Oswego Lake deregulation". The Oregonian. p. B1. ^ "Fishing at Oswego". The Oregonian. August 15, 1946. p. B1. ^ a b Myers, Hardy (April 21, 2005). "Oregon Attorney General Opinion No. 8281" (PDF). Oregon Attorney General. Retrieved March 12, 2012. ^ Murphey, Kara Hansen (January 12, 2012). "Oswego Lake access is focus of group". Lake Oswego Review. Retrieved April 20, 2013. ^ a b Bailey Jr., Everton (February 12, 2012). "Lake Oswego residents, critics spar over public access to 415-acre lake". The Oregonian. Retrieved February 12, 2012. ^ Murphey, Kara Hansen (February 23, 2012). "Oswego Lake: It is private — or is it?". Portland Tribune. Retrieved April 20, 2013. ^ Thomas, Doug (October 20, 2011). "Oswego Lake portrayed wrongly". Lake Oswego Review. Retrieved April 20, 2013. ^ Cizmar, Martin (May 24, 2012). "Oswego Lake Access Issue Heads to Federal Court". Willamette Week. Retrieved May 24, 2012. ^ Harbarger, Molly (October 12, 2012). "Oswego Lake access suit plaintiffs plan to file in state court after dismissed by federal court". The Oregonian. Retrieved December 18, 2012. ^ Cizmar, Martin (May 24, 2012). "Oswego Lake Lawsuit Now in State Court". Willamette Week. Retrieved December 18, 2012. ^ Runquist, Justin (January 10, 2014). "Judge sides with city in lawsuit over public access to Oswego Lake". The Oregonian. Retrieved January 16, 2014. ^ Bamesberger, Michael (April 25, 2014). "Oswego Lake access lawsuit heading back before judge". The Oregonian. Retrieved July 18, 2014. ^ Sorenson, Saundra (July 17, 2014). "Oswego Lake lawsuit appeal adds some 'friends'". Lake Oswego Review. Retrieved July 18, 2014. ^ Bailey, Everton (May 4, 2017). "Oregon Court of Appeals upholds Oswego Lake public access ban". The Oregonian. Retrieved August 13, 2017. ^ Bailey, Everton (May 8, 2017). "Duo aim to bring fight over Oswego Lake public access to Oregon Supreme Court". The Oregonian. Retrieved August 13, 2017. ^ Cizmar, Martin (June 13, 2017). "Meet the Heroes Suing to Free Oswego Lake, the Portland Area's Forbidden Paradise". Willamette Week. Retrieved August 13, 2017. ^ Bailey Jr., Everton (October 6, 2017). "Oregon Supreme Court says it will review public access to Oswego Lake". The Oregonian. Retrieved November 15, 2017. ^ Macuk, Anthony (October 6, 2017). "State Supreme Court will hear Oswego Lake access case". Lake Oswego Review. Retrieved November 15, 2017. ^ Tims, Dana (October 31, 2006). "Drawdown under way to lower Oswego Lake". The Oregonian. ^ Newell, Cliff (July 29, 2010). "Sewer project will make Oswego Lake disappear – briefly". The Oregonian. Retrieved April 20, 2013. ^ Newell, Cliff (June 2, 2011). "LOIS is flush with success". Lake Oswego Review. Retrieved April 20, 2013. Fulton, Ann (2002). Iron, Wood & Water: An Illustrated History of Lake Oswego. San Antonio, Texas: Historical Publishing Network and the Oswego Heritage Council. ISBN 1-893619-26-5.